(2014) ‘‘Journalists’ and their organisations must be the driving force for the future of journalism’’ – this is the notion highlighted in the study published by the European Federation of Journalists (EFJ) today about finding ways to sustain quality journalism. Authored by Andreas K. Bittner, the study on Confronting Austerity: Financial and Employment Models in Journalism was the result of a one-year project carried out by the EFJ to find out how journalists and their organisations can confront the crisis and respond to / take advantage of the rapidly changing media landscape. 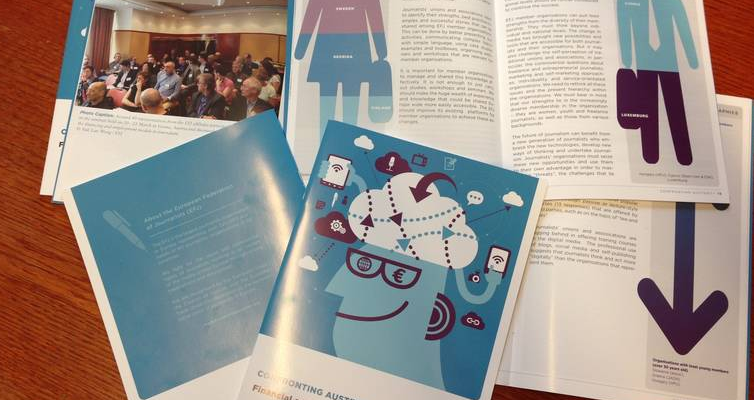 Responses collected from 42 EFJ affiliates across Europe show that some organisations have developed measures to help journalists adapt to the new media landscapes, such as the offering of new training programmes on digital, entrepreneurial and networking skills. However, many organisations continue to lag behind in developing such services for their journalists. Although the study confirms that a growing number of freelance journalists are facing precarious working conditions, there are some freelancers who have proven that they can be the driving force for the new business models and create new jobs for others. “Although we have seen new financing models emerged such as paywalls, crowdfunding, foundations and sponsorship, they remain as marginal modes of financing that have yet to been seen whether they can be sustainable in the long term. Nevertheless, the German crowdfunding project Krautreporter is among the very few successful examples that defies the rule and aspire others to follow suit,” added Gutiérrez. The study also identified the need for journalists’ organisations to address their ageing membership and to encourage membership diversity to include more women and young journalists in their decision-making bodies. The good news is that journalists and their organisations are responding to the challenge of digital transition. Like most of its affiliates, the EFJ remains optimistic. But we need publishers on board and they should start investing in the newsrooms instead of cutting back. Only quality journalism can ensure the industry’s survival in the competitive market. In order to do so, we need newsroom staffed with professional journalists who are well trained and working in decent conditions”, added Gutiérrez. The study was launched today in Skopje, Macedonia, during the EFJ Trade Union Leadership workshop by the EFJ President, Mogens Blicher Bjerregård. It is funded by the European Commission, DG Employment and Social Affairs and is available in three languages – English, French and German.